The first combat operation of the Huey was in the service of the U.S. Army during the Vietnam War. The Huey was developed by Bell Helicopter in 1952 to meet the United States Army's requirement for a medical evacuation (MEDEVAC) and utility helicopter. It is powered by a single, turboshaft engine, with a two-bladed main rotor and tail rotor. The original designation of HU-1 led to the helicopter's nickname of Huey. Approximately 7,000 UH-1 aircraft saw service in Vietnam. Seating capacity is 15, including crew. The cabin also accommodated six stretchers and a medic. Large doors were installed with two windows, plus a small hinged panel with an optional window, providing access to the cabin. The doors and hinged panels were quickly removable, allowing the Huey to be flown in a "doors off" configuration. 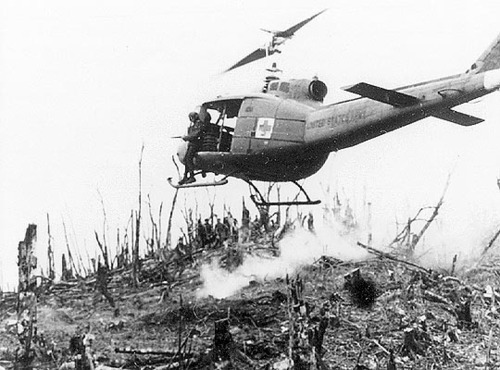 The UH-1 is seen in many films about the Vietnam War, including The Green Berets, Platoon, Hamburger Hill, Apocalypse Now, Casualties of War, and Born on the Fourth of July. It is prominently featured in We Were Soldiers as the main helicopter used by the U.S. Cavalry in the Battle of Ia Drang. June 2013 Scofield Catering purchased this Bell UH-1 Iroquois and with our catering expertise we have created a unique bar and barbecue for use at special events.